BACKGROUND AND PURPOSE: We investigated the use of 2-poly-hydroxyethyl-methacrylate (2-P-HEMA) as an embolic agent in swine arteriovenous malformations (AVMs). METHODS: In seven mini swine, experimental AVMs were created surgically. The aim of treatment was complete embolization of the nidus compartment filled by the feeding artery, without brain embolization. Six animals received pure liquid 2-P-HEMA, and one, 50% 2-P-HEMA. For radiopacity, liquid 2-P-HEMA was mixed with tungsten powder. Six animals underwent angiographic follow-up within 5–8 mo (mean, 6.5 mo). Evaluation criteria were controllability, procedural reproducibility, and duration of the nidus occlusion. To detect complications, brain MR imaging and CT were performed. Histopathologic studies were performed to prove occlusion and assess histopathologic responses. RESULTS: 2-P-HEMA was easily injected through microcatheters, with a reproducible technique. Because of the radiopacity of the mixture, deep nidus penetration was controlled with fluoroscopy and confirmed with CT and histopathologic examination. In five AVMs embolized with pure 2-P-HEMA, feeder obliteration was long term. One animal had vasospasm during embolization, and complete obliteration of the main feeder was maintained for 3 mo, but partial recanalization developed 2 mo later. One animal receiving pure 2-P-HEMA had an infarction. 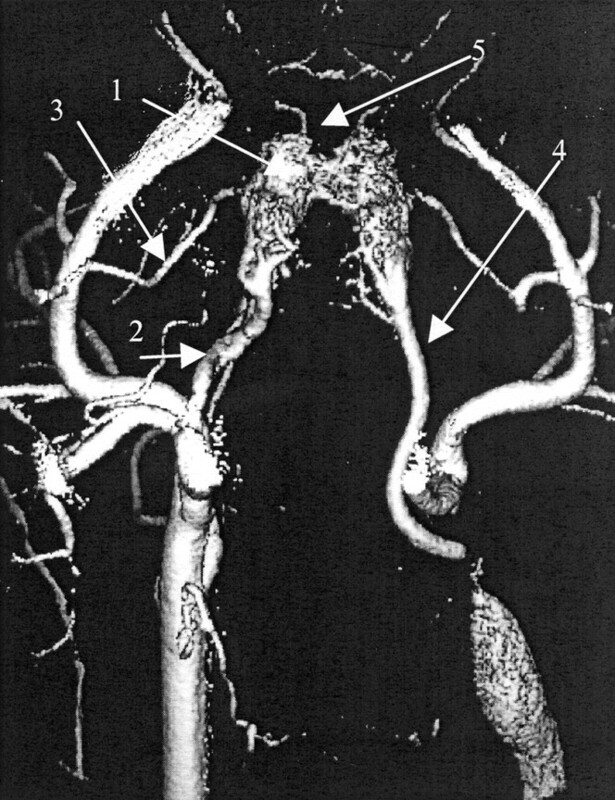 In the animal embolized with 50% 2-P-HEMA, angiography and CT revealed embolic material in the circle of Willis; the animal died after embolization. No marked inflammatory reaction in the vessel wall or perivascular tissue was observed in the embolized AVMs. CONCLUSION: Experimental AVM embolization with pure 2-P-HEMA, made radiopaque with tungsten, is technically feasible in swine. Because of its properties, 2-P-HEMA has great potential as a therapeutic embolic agent. Surgery, radiosurgery and endovascular embolization are the basic methods for the treatment of arteriovenous malformations (AVMs) (1). Embolization materials include microcoils, microballoons, and particulate emboli (2–5), as well as liquids such as cyanoacrylates and polymer solutions (6–14). Among the liquids, cyanoacrylates are difficult to handle; sometimes, they cause the catheter to adhere the artery, and to our knowledge, their neurotoxicity has not been formally evaluated (6). Polymer solutions have been used for endovascular embolization; however, they are unsuitable for most embolizations because, upon precipitation, they form a soft and flaky mass after contact with blood (12). Some satisfactory embolic liquids are based on dimethylsulfoxide (DMSO); however, in addition to its general toxicity, DMSO has angionecrotic properties and may cause degeneration of the white matter or damage the tissue surrounding the AVM (13–17). Therefore, a search for an embolic material with optimized physical characteristics and better biocompatibility is mandatory. Our study was conducted to prove the hypothesis that embolization of experimental AVMs with liquid 2-poly-hydroxyethyl-methacrylate (2-P-HEMA) (made radiopaque with tungsten) is technically feasible. Our aims were to determine the physical properties of 2-P-HEMA, to test the safety of the endovascular procedure, to evaluate the stability of the nidus occlusion, and to examine the histopathologic response to the embolic material. Animal experimentation and handling were conducted in accordance with the national laws for animal protection, and the study protocol was approved by the review board for care of animal subjects in the local government. Seven female Yucatan mini swine (Suis scrofa) were used in this study. The animals were 12–14-mo old, weighed 14–20 kg, and were fed a standard laboratory diet. The experimental AVMs were created according to the method of Massoud et al (18) with the modification described by Klisch et al (19). Postoperative control angiograms of the right common carotid artery (CCA) and vertebral arteries (VAs) were obtained immediately after fistula creation in all mini swine (Figs 1, 2). Prior to embolization, the anatomic situation was evaluated in detail by obtaining superselective angiograms of the pharyngeal artery (PA) and two minor branches from the right external carotid artery (ECA), which also supply the rete mirabile (RM), the ramus anastomoticus (RA), and the anastomotic artery (AA) (Fig 2A). Three-dimensional rotation digital subtraction angiographic (DSA) image of the RM nidus (arrow 1) after surgical construction of the end-to-end anastomosis between the CCA and external jugular vein (EJV) on the left side. The left CCA distal to the fistula has been ligated. Note the main feeding ascending PA (arrow 2), RA of the meningeal branch of the right ECA (arrow 3) and left PA (arrow 4, draining vein). Also note that the anterior branch of the right internal carotid artery (ICA) originates from the RM (arrow 5). A, Superselective angiogram demonstrates collaterals between the RM and basilar system (arrow). B, Angiogram obtained after surgical creation of the fistula between the CCA and EJV shows the extensive collateral network between the right VA (arrow 1) and ascending PA (arrow 2) on the left side. Note filling of the right ascending PA (arrow 3) and RM (arrow 4) by ipsilateral collaterals. The BA (arrow 5) has a small diameter. For endovascular embolization, we used the synthetic hydrogel (2-P-HEMA), which is based on poly-2-hydroxyethyl-methacrylate (Wichterle & Vacik, Prague, Czech Republic). The substance is prepared by means of copolymerization of a mixture of 2-hydroxyethyl-methacrylate and 2-(2-hydroxyethoxy)ethylmethacrylate monomers. The hydrophilic copolymer is suitable for medical applications (eg, soft contact lenses). 2-P-HEMA can be dissolved in 70–90% ethanol; 11% 2-P-HEMA by volume was dissolved in 89% ethanol by volume to make pure 2-P-HEMA, and 5.5% 2-P-HEMA by volume dissolved in 79.5% ethanol by volume to make 50% 2-P-HEMA). For embolization, sterilized 2-P-HEMA was mixed with tungsten powder (0.005 g/mL 2-P-HEMA) to obtain sufficient radiopacity. Because tungsten tends to settle, it had to be thoroughly mixed shortly before its application to minimize sedimentation. The embolic material was injected by using a 2.7F microcatheter (Target Therapeutics, Fremont, CA) filled with 0.3 mL of 70% ethanol to prevent polymerization inside the catheter. The catheter was flushed with saline before it was filled with ethanol. The goal of the treatment was complete embolization of the nidus compartment via the feeding artery, without embolization in the brain. The criteria for evaluating the feasibility, reproducibility, and safety of the embolization process with 2-P-HEMA were the following: 1) ease of passage through the microcatheter, 2) controllability (ability to define the starting and ending points of embolization, radiopacity, injection speed and volume), 3) extent and depth of penetration into the nidus compartment filled by the feeding artery, 4) duration of angiographic occlusion of the nidus compartment (long-term follow-up), 5) gluing of the microcatheter to the embolized vessel, and 6) detection of embolic complications with fluoroscopy and CT and/or MR imaging. To prevent neurologic complications in case of embolization of the nidus, the microcatheter was positioned in the PA distal to the main descending branches, from which anastomoses extend to the basilar system (Fig 2). In seven animals, we embolized nine feeding arteries of the AVMs: the main feeder (PA) in seven animals (Fig 3A) and the RA in two animals in which the AA seemed to be large enough to supply the ICA. Embolization of eight feeding arteries was performed with pure 2-P-HEMA. One feeding artery (PA) in one animal was embolized with 50% 2-P-HEMA. 2-P-HEMA was injected by hand and by using a Medallion syringe (Merit Medical Systems, South Jordan, UT). The volume was 0.4–0.8 mL (mean, 0.7 mL), the injection time was 1–8 min (injection speed, 0.1–0.4 mL/min; mean, 0.13 mL). One skilled neuroradiologist (J.K.) who was experienced in neurointerventional procedures performed all of the embolizations. Angiograms obtained before and after embolization. A, Oblique image obtained prior to embolization of the RM with roadmap technique shows that the microcatheter is positioned in the ascending PA close to the nidus and distal to the collaterals to the VA.
B, Oblique image obtained after embolization of the PA with pure 2-P-HEMA. The embolic agent completely fills the compartment. Note the intense radiopacity. Although the microcatheter is embedded in the 2-P-HEMA, it can be retracted without sticking. Top image shows embolization with the roadmap technique. Bottom image is an unsubtracted picture of the embolized nidus. C, Oblique control angiogram of the right CCA obtained after embolization of the ascending PA. The microcatheter is in the same position as in A. Collateral filling of the RM by the RA and AA is preserved. D, Control angiogram of the right CCA obtained 8 mo after embolization depicts long-term occlusion of the embolized feeder. After removal, the delivery catheter was controlled microscopically to determine if any embolic material adhered to the surface of the catheter. MR imaging was performed with a 1.5-T unit (Magnetom Vision; Siemens, Erlangen, Germany) with a standard gradient system and a circular polarized head coil to exclude cerebral infarction after AVM embolization. CT (ProSpeed SX Power; GE Medical Systems, Milwaukee, WI) was performed after embolization to exclude embolic material in cerebral arteries and to determine the extent of nidus embolization. Six animals underwent two angiographic follow-up investigations: the first at 1–3 mo after embolization and the second at 5–8 mo (mean 6.5 mo). Two neuroradiologists (L.Y., M.S.) evaluated the angiograms, and follow-up angiograms were compared with available pretreatment images. Stability of embolization was defined as long-term occlusion of the nidus filled by the feeding artery and occlusion of the distal feeding artery (PA or/and RA). A neuropathologist (A.P.) blinded to the embolization procedure performed the histopathologic examination in six AVMs embolized with pure 2-P-HEMA at 5–8 mo (mean, 6.5 mo) after the procedure. One animal embolized with 50% 2-P-HEMA was evaluated 15 h after embolization. The neurosurgeon removed the RMs, including the adjacent arteries, for histopathologic examination. Histologic preparation of the AVMs embolized with 2-P-HEMA was difficult. Preliminary studies proved that the standard protocols for this purpose failed for two reasons: First, dehydration cannot be achieved by using organic solvents such as graded ethanol, acetone, or dioxane. Second, the use of methyl-methacrylate–based embedding resins is obsolete because long-lasting staining procedures need ethanol as a solvent. To overcome these difficulties, we used Durcupan as an embedding medium. Samples were obtained radially, from left to right, at predetermined angles spanning the entire rete of the ascending PA. Specimens were fixed in 10% phosphate-buffered formaldehyde (Fisher Scientific, Fair Lawn, NJ) and dehydrated in 70% Durcupan A (Fluka, Buchs, Switzerland) for 3 d, 90% Durcupan A for 3 d, and 100% Durcupan A for at least 5 d. Specimens were incubated for 3 d in a mixture of Durcupan A (5.0 mL), Durcupan B (1.7 mL), and Durcupan C (1.2 mL) and polymerized for 3 d at 37°C. A sawing-grinding technique was used with a low-speed rotary diamond saw (Microslice; Metals Research, Cambridge, UK). The 40-μm grindings were subsequently stained in acid fuchsin (1%, 5 min), carbol gentian violet (4 min), and pararosaniline (1 min). In addition, scanning electron microscopy of the embolized AVMs was performed to analyze the castings of the nidus vessels. The results of AVM embolization are summarized in the Table. All animals tolerated the surgical procedure without complications. A successful AVM model with a feeding artery, nidus, and draining vein was achieved in all animals (Fig 1). Injection of 2-P-HEMA through the microcatheter was well controlled with fluoroscopy in all embolizations because of the intense contrast of the tungsten powder. The starting and ending points of the embolization procedure could be exactly determined with fluoroscopy. With pure 2-P-HEMA, a complete casting of the nidus compartment was achieved in all cases (six animals, eight feeders) without embolization of the brain vessels, as determined angiographically (Fig 3A and B). However, control angiograms showed that when the RM was embolized via the PA alone, a large part of the right RM could be obliterated (four animals) (Fig 3C). On the contrary, if the RM was embolized via the PA and RA, almost complete obliteration could be achieved (two animals), although the AA maintained perfusion of the circle of Willis. DSA images showed one vasospasm during embolization with pure 2-P-HEMA that led to early proximal occlusion of the PA. In all cases, the depth of penetration into the nidus was clearly detectable with the roadmap technique because of the intense contrast produced by the tungsten powder. The extent of embolization was confirmed with CT scans, which showed the contrast of the embolized nidus caused by 2-P-HEMA and tungsten (Fig 4A). Image obtained after embolization with 50% 2-P-HEMA. A, CT scan the of intracerebral vessels (arrow) shows intense contrast in the embolized RM. B, Coronal T2-weighted MR image obtained after embolization with 50% 2-P-HEMA shows a large cerebral infarction on the right side; the animal died. Because 2-P-HEMA is a nonadhesive material, it does not cause catheter obstruction or gluing if it is precipitated, and multiple repeated injections can be administered through the same catheter. The RM was filled, and the pedicle was obliterated with a single catheterization in most cases. 2-P-HEMA was delivered continuously because it was unlikely to cause the delivery catheter to become stuck in the vessel. After removal of the catheter, microscopic investigation revealed that no embolic material had adhered its surface. Removal of the microcatheter was easy in cases of flow arrest or contact between the microcatheter and 2-P-HEMA within the feeding artery after a precipitation period of 3–5 min, without adjacent unprecipitated 2-P-HEMA. In five animals embolized with pure 2-P-HEMA, the control MR image and CT scan of the brain was normal. In one animal embolized with pure 2-P-HEMA via the PA and RA, a partial infarction of the right hemisphere, without substantial neurological deficit, was found on the MR image. Polymerized 2-P-HEMA was suspected to have become dislocated into intracranial vessels that were undetectable at fluoroscopy during embolization. CT findings ruled out that there was no 2-P-HEMA embolization of the intracerebral vessels. During follow-up, complete and permanent angiographic obliteration of the compartments embolized with pure 2-P-HEMA was observed in five animals (seven feeders) (Fig 3D). In the animal in which vasospasm of the proximal PA occurred during embolization, 4.0 mL was injected into the PA with a speed of 0.4 mL/min. Complete obliteration was maintained for 3 mo after embolization, but a partial recanalization of the PA and a small part of the proximal RM developed 2 mo later. When 50% 2-P-HEMA was injected, an embolic complication was detected with fluoroscopy, resulting in unsatisfactory occlusion of the RM. Embolic material penetrated into the ICAs and mostly into the distal left RM. The CT scan confirmed 2-P-HEMA-embolization of the circle of Willis and intracerebral vessels on the right side (Fig 4A). CT and MR images revealed a cerebral infarction on the right side (Fig 4), and the animal died 15 h after embolization. At histopathologic examination, the embolized AVMs were dark because of the tungsten powder within the precipitated 2-P-HEMA. Microscopic examination performed 15 h after embolization revealed that various portions of the vascular lumina of the RM were filled with aggregates of dark tungsten powder within the polymerized 2-P-HEMA (Fig 5). The degree of vascular occlusion after embolization was as high as 80–90% (Fig 5A), as determined at light microscopy. Histopathologic and electron microscopic findings after embolization. A, Photomicrograph of an RM obtained 15 h after embolization with 50% 2-P-HEMA shows that the vessels (arrow) of the embolized RM are mostly filled with precipitated 2-P-HEMA, which is dark because of the presence of tungsten. As many as 90% of the vessels were completely patched with the embolic agent; others were partially occluded and thrombosed (original magnification ×25). B, Photomicrograph obtained 6 mo after embolization with pure 2-P-HEMA shows that the tungsten has been replaced by amorphous material resembling a calcification (arrow) (original magnification ×50). 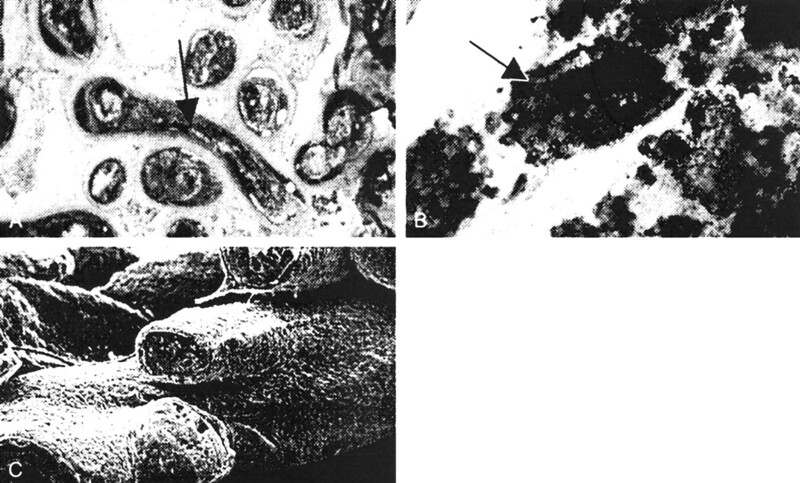 C, Electron micrograph of an AVM embolized with 50% 2-P-HEMA shows homogeneous casting of the vessel lumen due to precipitated 2-P-HEMA. No signs of subintimal bleeding, angionecrosis, or early marked inflammation were present. Electron microscopy revealed almost complete castings of the AVM; most vessels were completely filled with the embolic material. In all specimens evaluated 3–8 mo after embolization, fibrous tissue was present between the tungsten powder aggregates, with a mild chronic inflammation reaction. The amount of detectable tungsten was notably decreased, and the vascular lumina were mostly replaced by amorphous calcified material. Only a few reports about the use of nonliquid 2-P-HEMA under experimental and clinical settings are available (20). In a previous study, we tested 2-P-HEMA in a canine model of experimental embolization of sidewall aneurysms with stent protection (21). From this experience, we believed that the characteristics of the material supported its use in AVM embolization. Sterilizable liquid 2-P-HEMA with tungsten has a number of features that make it promising in the embolization of AVMs: It permits easy injection through a microcatheter, it has a clearly definable starting and ending point of the embolization; it is radiopaque (with tungsten); it quickly polymerizes upon contact with blood (unpublished data); it allows continuous, controlled, flow application; it solidifies in 3–5 min, which allows deep penetration into the nidal compartments; and the resultant nidus occlusion is stable. 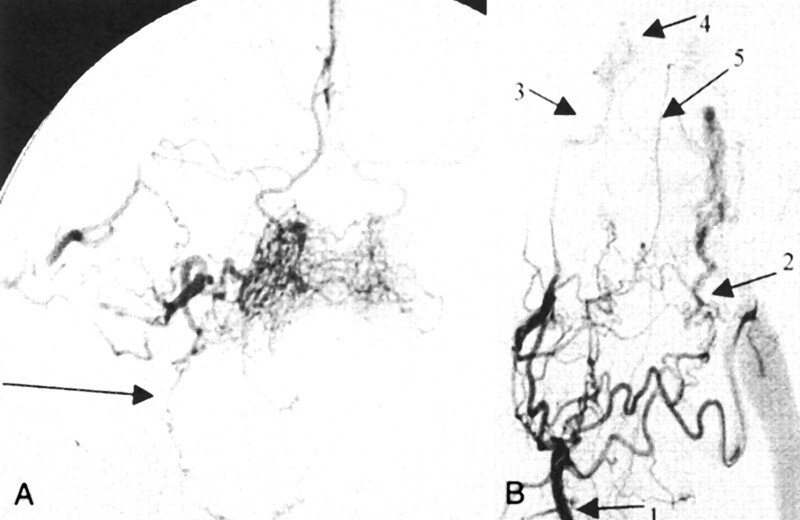 Because of the intense contrast enhancement of tungsten with 2-P-HEMA, controlling the embolization process of nidal occlusion with continuous fluoroscopy is possible with a roadmap technique; this can help prevent embolization of brain vessels, as determined angiographically (Fig 3B) and confirmed with CT. Therefore, the application of pure 2-P-HEMA seems to be safe. 2-P-HEMA is a nonadhesive material if it precipitates, but the rate of precipitation varies depending on whether the injection is administered in a condition of flow arrest or not. In flow arrest, the delivery catheter can be easily removed from the embolized feeder after 3–5 min (Fig 3B). Therefore, embolization with 2-P-HEMA is easy, and its application is similar to that of ethylene-vinyl alcohol (16). Because tungsten tends to settle, it must be thoroughly mixed shortly before its application to minimize sedimentation. Development of a biopolymer 2-P-HEMA with radiopaque characteristics that can simultaneously act as an embolic material and a contrast agent should eliminated the problem of separation of the insoluble tungsten from the polymer solution. We hypothesized that the embolization of experimental AVMs with liquid 2-P-HEMA is technically feasible. The aim of treatment was complete embolization of the nidus compartment without embolization in the brain. With pure 2-P-HEMA, this aim was achieved in all cases, in contrast to 50% 2-P-HEMA (one animal). The precipitation dynamics of pure 2-P-HEMA (versus those of 50% 2-P-HEMA) allow its constant and exact application through the microcatheter to deeply penetrate the nidus (as depicted angiographically and confirmed with CT and histopathologic findings), and they resulted in a high primary occlusion rate in the feeding artery (all AVM feeders embolized with pure 2-P-HEMA were completely occluded). Complete obliteration of the compartment previously fed by the PA was achieved in all animals (Fig 3). For anatomic reasons, when the RM was embolized via the PA, only a large part of the right RM could be occluded (four animals). If the RM was embolized via the PA and RA, nearly complete casting could be achieved (two animals), although the AA maintained perfusion of the ICA. 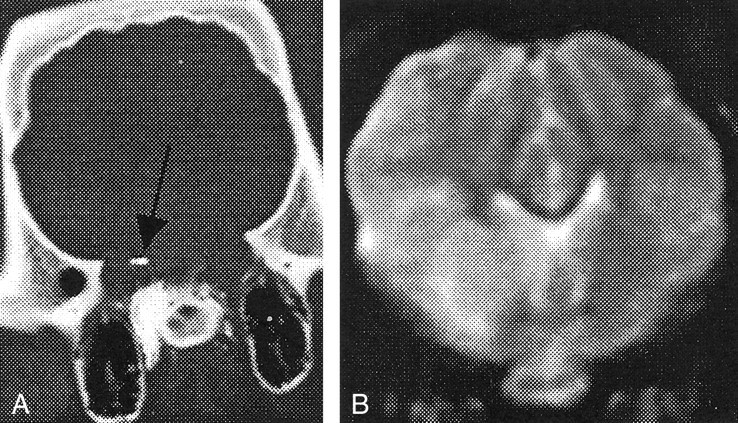 In one of the first animals embolized, a partial infarction of the right cerebral hemisphere (without neurologic deficit) was found on the MR images, but fluoroscopic and CT images showed no embolic material within the intracranial vessels or brain. Therefore, the embolic agent was not likely to be the cause of this infarct. A possible explanation is an angiotoxic reaction to the ethanol or, more likely, an insufficient collateral blood supply to the brain (embolization of the PA and RA). On angiograms, the collateral flow of the AA appeared to be sufficient. In five animals embolized with pure 2-P-HEMA, brain MR images were normal. Therefore, ethanol, by itself, was unlikely to have caused the cerebral infarction. In previous studies, MR imaging and CT were not performed after AVM construction and embolization (18). Therefore, asymptomatic cerebral infarcts may not have been diagnosed in the first place. Also, in cases of cerebral infarction, whether the complication was caused by AVM construction, insufficient blood supply from the VA and BA after complete embolization of the RM, or embolization of the RM and ICA or/and collaterals is not clear. When the RM nidus is used to create the AVM model, and in the view of animal protection, showing how the animal’s death can be avoided is important. In the case of embolization of the RM, we assumed that CT and/or MR imaging after embolization had advantages in helping to prevent the embolization of intracranial vessels, which can lead to brain infarction despite angiographic monitoring of the procedure. We did not regularly perform complete occlusion of the entire nidus by embolizing the PA, RM, and RA, because, with respect to the small diameter of the VA and BA, complete occlusion of the RM alone may have led to brain infarction in these cases. With this strategy, it was easier to detect and differentiate embolic complications caused by AVM construction and ischemic-embolic complications caused by ICA or VA and BA embolization. Without these data, one might believe that an embolization is successful when, in fact, clinically silent ischemia has occurred, as it did in one animal. This animal died 15 h after embolization with 50% 2-P-HEMA. CT revealed embolization of the ICAs and intracerebral vessels on the right side, and MR images showed a cerebral infarction in the same hemisphere (Fig 4). 2-P-HEMA was highly stable within the AVM. During follow-up, the embolized compartments were completely obliterated in all animals but one. In this animal, compete obliteration was maintained for 3 mo after PA embolization, but partial recanalization developed 5 mo after embolization. We assume that the injection speed of 0.4 mL/min in this animal was too high and that it caused vasospasm. Therefore, 2-P-HEMA should be injected slowly, with an injection speed of approximately 0.1 mL/min. At 3–8 mo (mean, 6.5 mo) after embolization, we found precipitated 2-P-HEMA with connective tissue growth and a moderate chronic inflammatory reaction, without a foreign body reaction (giant cells) inside the AVM and surrounding tissue. In accordance with our histopathologic results with liquid 2-P-HEMA embolization, Horak et al (20) showed that particles of 2-P-HEMA did not provoke any destructive, dystrophic, or inflammatory changes in the vessel wall. This finding correlates well with those of clinical and histopathologic examinations of sponges made of 2-P-HEMA that were implanted into the rabbit cornea; these are well tolerated by stromal and limbal tissues (22–24), as demonstrated with cell-culture toxicity tests of 2-P-HEMA particles (25). In addition, a 2-hydroxyethyl-methacrylate–containing dental resin had low toxicity at long-term follow-up (23). We suggest that, in AVM embolization, the primary occlusion effect is based on a combination of polymerized 2-P-HEMA, adsorption of plasma proteins (eg, fibrinogen), cross-linking with surface proteins of the vessels of the RM (which interfere with the hydrophilic COO− binding sites of 2-P-HEMA), and built-in cellular blood elements (aggregates of thrombocytes and erythrocytes) (20, 26). Ultrastructural studies of extracted intraocular lenses made of poly-hydroxyethyl-methacrylate revealed an ultrathin membrane-like structure composed of adsorbed proteins (22). Our electron microscopic observations confirmed the angiographic and microscopic findings in an AVM casting (Fig 5). As many as 90% of the vessels were completely patched with the embolic agent; others were partially occluded and thrombosed. Despite the possible sclerotizing effect of liquid 2-P-HEMA dissolved in 89% ethanol (which was needed as a solvent), no angionecrosis was observed in the surrounding tissue. Because highly concentrated ethanol causes necrosis of the vessel wall, 2-P-HEMA must be injected slowly at a rate of about 0.1 mL/min. Therefore, the application of 2-P-HEMA is similar to that recommended for Onyx. In contrast to other polymers (eg, cellulose acetate, cellulose acetate NF, ethylene-vinyl alcohol copolymer [6, 16]), 2-P-HEMA–ethanol solution needs no further additive solvent, such as DMSO. Further studies are necessary because of the small number of animals in this study and because these specimens were examined either very early or very late after embolization. The purpose of such studies might include the following: 1) to determine the early histopathologic response to liquid 2-P-HEMA after 2–3 d and after 2–4 wks (to confirm our results that were obtained 15 h after embolization) and 2) to find medium for the solution that is more biocompatible. If the ethanol content is 50%, 2-P-HEMA precipitates too slowly and has the risk of passing into the venous circulation, as it did in one animal. Ethanol solutions of polymers, such as polyvinyl alcohol and polyurethane, and 70% ethanol have been used as sclerotizing agents (6, 16, 27); therefore, liquid 2-P-HEMA should be injected very slowly to prevent sclerotizing reactions. It could be injected at a faster rate if sclerotizing effects (eg, embolization of arteriovenous fistulae) are desired. On the other hand, sclerotizing effects and activation of local hemostasis with liquid 2-P-HEMA show promise in the immediate control of various hemorrhages or tumor embolization. Furthermore, the hemostatic activity could be increased with the adsorption of ethamsylate and aminocaproic acid in particles of 2-P-HEMA (28). However, as a solvent, ethanol would effect the use of 2-P-HEMA as a carrier for drugs. Favorable results with particles combined with methotrexate or 5-fluorouracil were found in patients treated for hemobilia, hemangioma, or hypervascular tumor in the liver (20, 28–31); these findings open another field of endovascular therapy with hydrogels. Experimental AVM embolization with pure 2-P-HEMA, made radiopaque with tungsten, is technically feasible in the swine model. This agent apparently provides long-term occlusion of vessels, is easy to deliver, and is unlikely to cause the delivery catheter to become stuck in the vessel. Radiopacity is sufficient, the application technique is safe, and deep penetration into the nidus is achievable. The nidus occlusion lasted for as long as 8 mo. Because of its properties, 2-P-HEMA has great potential as a therapeutic embolic agent. We did not detect any toxic histopathologic response to the material; however, a careful histologic study of acute, subacute, and chronic effects is warranted to assess acute angionecrosis and aggressive inflammatory reactions. The material may need further modification because, at this time, the technique has some limitations, including the requirement for ethanol as a solvent. Until now, 2-P-HEMA has not been available in higher concentrations, and this may be a disadvantage when 2-P-HEMA is compared with other liquids. Although the method presented is still far from ready for use in patients undergoing neurointerventional procedures, it does seem promising for future development. We gratefully acknowledge Mrs Lindner and Mrs Eckerle for their technical assistance. Accepted after revision October 8, 2001.